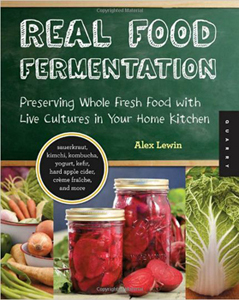 New Fermentation Book: "Real Food Fermentation"
My friend Alex Lewin, author of the blog Feed Me Like You Mean It, has recently written a book titled Real Food Fermentation. The book covers fermentation of all kinds of foods and beverages, including lacto-fermented vegetables, dairy such as yogurt and kefir, fermented fruit condiments, and kombucha of course! I even contributed a few pages to the kombucha section of the book, offering tips on how to take care of kombucha cultures! Alex Lewin is a graduate of Harvard, The Cambridge School of Culinary Arts, and the Institute for Integrative Nutrition. He calls himself a health strategist, advocates for real and healthy food, and serves on the board of the Boston Public Market Association. Read more about Alex Lewin here. "It is a photo-illustrated, step by step cookbook that shows you how to make fermented foods. The photos really make the recipes come alive (pun intended!). And they are beautiful photos; my photographer is an ace. There are other fermentation books out there, including some new ones, but to be honest, mine is the prettiest by far, and the step by step pictures make my recipes very easy to follow." The photographs in the book really are gorgeous. In addition, I would highly recommend Alex's sauerkraut recipe (also provided in his book), which I have been using ever since he did a Sauerkraut Demo with Slow Food BU! To purchase Real Food Fermentation, ask your local independent bookstore to order it for you, or purchase it on Amazon this Monday, June 18, which will help to promote the book and help it to rise on Amazon's best-sellers list. Of course, if you cannot purchase the book on June 18, purchase it anytime! For more information and updates about Real Food Fermentation, visit http://RealFoodFermentation.com.